Unless you’ve been living under a rock — or were too busy enjoying Ariana Grande’s ’90s fest at Coachella — you know that Game of Thrones was all anyone was talking about this past weekend. And with all this buzz around the final season premiere, it’s no surprise that Urban Decay’s collection inspired by the series sold out in a few hours on the brand’s website. If you weren’t able to get your hands on the line or didn’t even know it existed ( GoT premiere party planning consumed you, we get it), don’t worry — you can still snag one of the star products through an exclusive retailer. The Game of Thrones eyeshadow palette, which sold out on UD’s website yesterday, can still be bought exclusively on Macy’s website today and tomorrow (while supplies last). 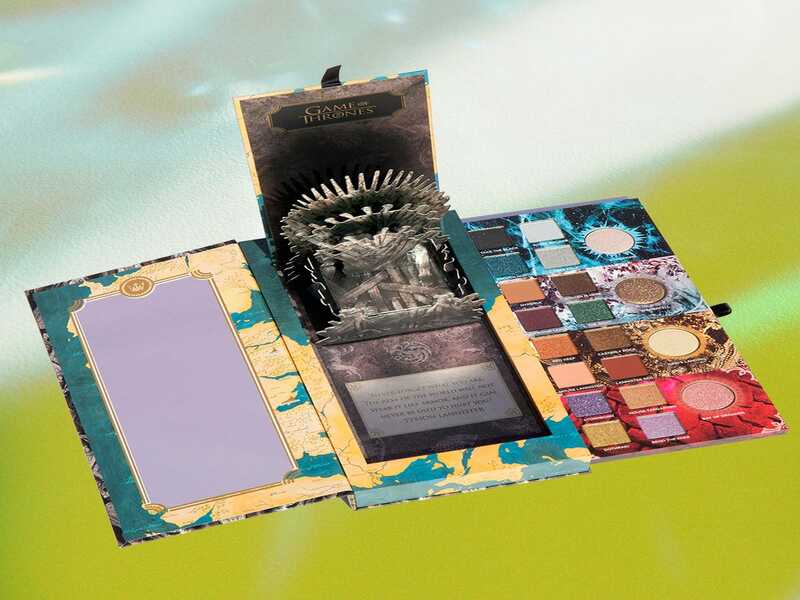 The limited-edition palette comes with 20 shades, which are organized into four shade groups that represent House Targaryen, House Lannister, House Stark, and the White Walkers. Overall, the palette includes metallics, mattes, and a variety of shades, from jewel tones to earthy neutrals. The shades also have fun names inspired by the seven kingdoms (and beyond the wall) including Free Folk, Red Keep, and Bend The Knee. But the highlight of it all is the packaging that features a pop-up throne, large mirror, and an empowering Tyrion Lannister quote (because who else better to quote?). This collection — which was officially done in collaboration with HBO — won’t be available online at Sephora and Ulta until April 29th, so this flash sale would guarantee you get the eyeshadow palette weeks ahead of the major drop. You’ll have to wait until the end of the month to get the rest of the products in the collection, including the highlighter trio, eyeliners, lipsticks, and makeup brushes. And can we take a moment of appreciation for the fact that the makeup brushes are shaped like swords (Arya and Jon’s to be exact)? So, if you’re having a hard time accepting that winter the end is here for Game of Thrones, you can keep the storyline alive — on your eyelids.